Time for another Need to Know podcast to hit the airwaves and in this episode I’m joined by SharePoint MVP Ishai Sagi to talk about some of my favourite subjects, SharePoint and Office 365. We discuss the power of SharePoint, especially in the SMB market and ponder why it hasn’t been as readily adopted as it could be. We discuss the huge opportunities around SharePoint and Office 365 for customers and resellers. I am always on the look out for guests for the podcast. So if you’d like to discuss a topic, it doesn’t have to be about technology, please contact me (director@ciaops.com) and share you knowledge with the audience. I am proud to announce that the CIAOPS Desktop to Cloud event has now opened for registrations. Information and registration can be found at www.desktoptocloud.com.au. You can obtain a 50% early bird discount to the event by using the promotional code EARLYBIRD prior to the 5th of May. This event will consist of two tracks, one for consumers and one for IT Professionals and will provide the latest information on desktop software like Windows 8, Office 2010 as well as information about cloud technologies such as Office 365 and Windows Intune. It will be provided by a range of speakers and include all meals, parking and WiFi access. I am also interested to hear from anyone who may be interested in speaking at the event. Please contact me (director@ciaops.com) for information about submitting a session. I have blogged here before about the issue around Search Server Express 2008 on SBS 2008. However it is a different story when it comes to search Server Express 2010 on SBS 2011 as I will briefly show here. and I appreciate everyone who does purchase a copy to support what I do. I’ll also tip my hat to Susan Bradley for providing me a test SBS 2011 Standard server to work all this out on. There are a few very, very important warnings that you MUST take note of before proceeding. A. 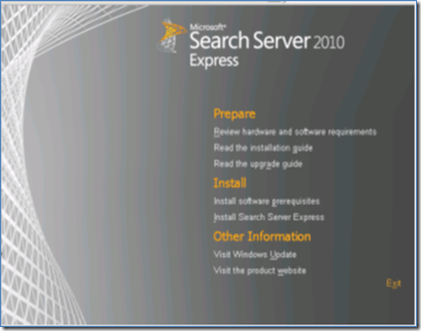 Installing Search Server Express 2010 on SBS 2011 makes SBS 2011 ‘non-standard’. This doesn’t mean it isn’t supported what it means is that the default SharePoint on SBS gets modified which has ramifications for patching, updating and troubleshooting. B. You MUST know your SharePoint farm passphrase. On SBS 2011 this passphrase is randomly generated during installation. 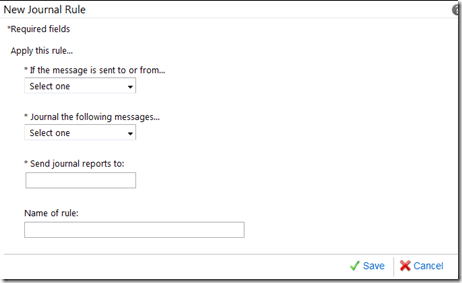 If you don’t know it you need to set it to something you know while SharePoint is working! See this previous blog post for more information. C. Search Server express 2010 is going to stress you SBS 2011 box, especially when it indexes content. You can configure this but beware that large amounts of indexing really ‘pegs’ the box. D. Make sure you can roll back any failed installation. This may mean uninstalling Search Server express 2010, which requires reconfiguring SharePoint as well as knowing the farm passphrase. I won’t be covering that here. That’s why I recommend you buy my e-book to get all the info. These aside Search Server Express 2010 on SBS 2011 will allow you to provide a single search interface across just about all your network data. Search is really the ‘killer app’ in our information overload society. When people want to find information where do they go? To a search engine! Problem is most search engines only look outside a business but with Search Server Express 2010 you can now index and search your internal information. Who wouldn’t want that? best of all Search Server Express 2010 is free. The ability to search SharePoint content on SBS 2011 Standard is provided by default, however it is limited to only the content contained within the Companyweb site. With the installation of Windows Search Server Express 2010 it is possible to not only search Companyweb content but also network file shares, web sites and Exchange Public folders. One down side with installing Search Server Express 2010 over the existing installation of SharePoint on SBS 2011 standard is that it doesn’t directly integrate into the existing search functionality within Companyweb. This means that if you use standard Companyweb search (located in the top right of most pages) you will only be able to search Companyweb content even when Search Server Express 2010 is installed. To search across network file shares, web sites, Exchange Public Folder and Companyweb content you will need to use a special Search Center subsite once Search Server Express 2011 has been installed. The general recommendation is to install Search Server Express 2010 and SharePoint Foundation 2010 on a dedicated member server in a network. However, in this example we will be installing it here onto an existing SBS 2011 Standard machine. This means that you need to ensure that your SBS 2011 Standard SharePoint installation does not require any more updates. The easiest way is to logon to the SBS 2011 Standard console. From the Start Menu select All Programs, then Microsoft SharePoint 2010 Products, then SharePoint 2010 Central Administration. Accept any User Account Control (UAC) that you see. From the menu on the left of SharePoint Central Administration select Systems Settings and then Manage Servers in this farm from under the Servers heading at the top of the right side of the page. You should now see a screen like that shown previously. If the Status column for your SBS 2011 Standard server DOES NOT show No Action Required, as it does above, then you will typically need to run the PSCONFIG command line option to complete any SharePoint Foundation upgrade. Information on completing this process is contained in the link provided above. It also vital that you know what the passphrase for the SharePoint farm is. . It is also vital that prior to commencing any of this work that you ensure you have a recovery process including a verified set of backups. With all the preliminary work completed and the Search Server Express 2010 software downloaded we are ready to commence the installation. Log onto the SBS 2011 Standard server as an administrator and right mouse click the downloaded Search Server Express 2010 file to commence the installation and select Run as administrator from the menu that appears.. The required files will firstly be extracted to the server. Accept the User Account Control window by clicking the Continue button. The files will then be extracted and the installation commenced. You should now see a Start screen displayed. In this window select the option Install the prerequisites. You should now see the welcome screen. Click Next to continue. The server will be checked to ensure that it meets all the minimum requirements and is configured correctly. During this process you may find that an additional number of required components are downloaded and installed on the SBS 2011 Standard server. These will be done automatically and generally a reboot will not be required but you should be aware of the possibility. When the process is complete you may need to take further action as recommended by the tool. Click Finish to complete the process. You will now be returned to the Start window. 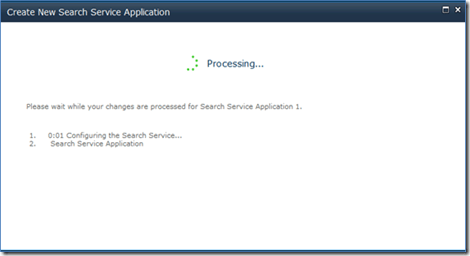 From here now select the option Install Search Server Express. This will commence the installation wizard. The first screen you will see is the software license agreement. Check the I accept the terms of this agreement box at the bottom and click the Continue button to proceed. You’ll then be asked for a default installation location for the binary files. Accept the default location and click the Install Now button. You should now see the Installation Progress screen as shown above and the status bar should move from left to right as the program is installed on the SBS 2011 Standard server. Once the installation has completed you will then be prompted to run the Configuration Wizard as shown above. Simply leave the checkbox Run the SharePoint Products Configuration Wizard now checked and click the Close button. 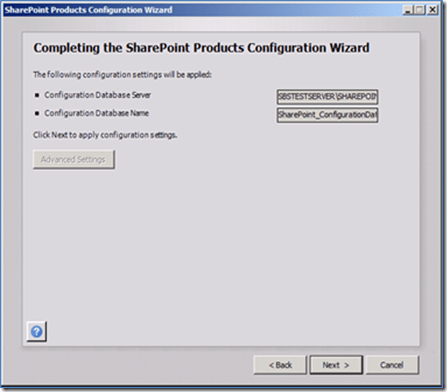 The SharePoint Configuration Wizard should now launch as shown above. Click the Next button to continue. This may affect other users on the network and if so you should prepare them for interruption to their normal programs. Click the Yes button to accept this warning and continue. Then click the Next button to proceed. Since SharePoint has already been installed on SBS 2011 Standard you will be prompted with the details of the existing configuration database like shown above. The configuration process will now continue. The only option available is to stop the process via the Cancel button. You will notice during the installation process (Step 9) that the existing SharePoint farm on SBS 2011 Standard will be upgraded. As mentioned previously, this now makes the original installation of SharePoint on SBS 2011 Standard ‘non-standard’. When the process completes you should receive a success message like shown above. Click the Close button to continue. Internet Explorer will now be launched and you’ll be taken to the SharePoint Central Administration web site. You should then see the prompt asking whether you wish to sign up for the customer experience. 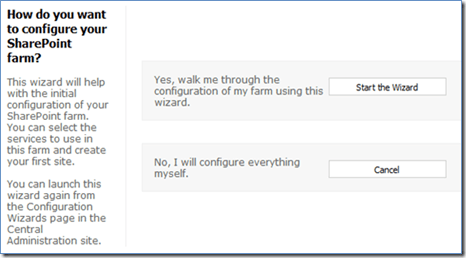 Make your select and click OK.
You’ll now see the option to run the SharePoint configuration farm wizard. 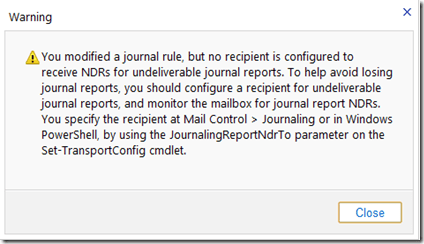 Here it is important to select Cancel to terminate the wizard. If you elect to run the wizard you will damage both the Search Server Express 2010 installation and the default SharePoint on SBS 2011 Standard installation requiring a reinstallation of both components. Although in most cases you use wizards on SBS 2011 Standard, with SharePoint on SBS you should NEVER run the configuration wizard. After you cancel the SharePoint wizard you will be returned to SharePoint Central Administration as shown above. Select Application Management from the left and then Manage service applications from under the Service Applications heading in the middle of the page. 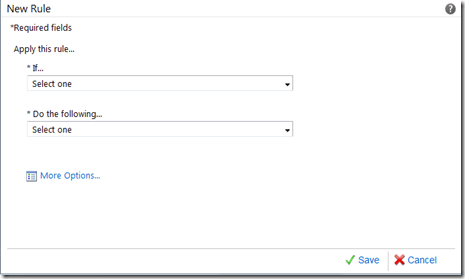 You will now manually configure the Search Server Express Service into the existing SharePoint Farm. Select the arrow at the bottom of the New button in the upper left side of the window and from the menu that appears (as shown above) select Search Service Application. You will now be prompted to enter the configuration details for the new Search Service. 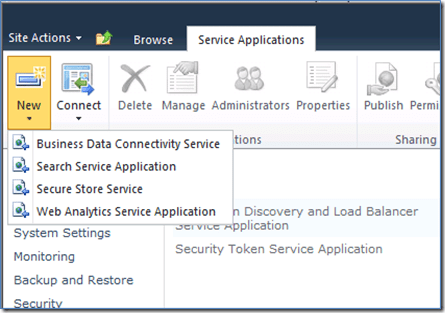 Leave the Service Application name as default (Search Service Application 1). Leave the Search Service Account as default (\spfarm). Scroll down the screen for more options. It is recommended that you create a new application pool. It is recommended that you use a descriptive name (here SearchServicePool). Leave the service account as default (here \spfarm). Scroll down the page for more options. It is recommended that you also create a new application pool for Search Query (here SearchQueryPool) and use the default service account (\spfarm). Scroll down the page and select the Save button when complete. You should now see the Search Service being configured as shown. This may take several minutes depending on the specifications of your hardware. There are two phases that the configuration needs to complete. The second phase generally takes much longer than the first. When the process is complete you should receive a success message like that shown above. When you close that window you will be returned to the SharePoint Service Application page. Here you should see additional services listed as shown above. You will also see that the Search Service Application 1, or the name you called the Search Service name is a hyperlink. If you click this you will then be able to configure the Search Service. If you now look at the services on the SBS 2011 Standard server you will notice an additional SharePoint Service called SharePoint Server Search 14. To configure the Search Service simply click on the hyperlink in Central administration shown above and add the additional content sources you desire. Finally, to actually use the Search Service create a subsite in Companyweb based on the Search template that is now available. I will again point you to my e-book as the most comprehensive source of getting everything working. If you want to learn about the opportunities around “Cloud” computing, especially with Office 365 then this workshop is for you. You will learn not only about the Microsoft Office 365 product indepth but also how to re-engineer your business for the “Cloud”. You’ll learn business strategies that will help drive you more business and have opportunities knocking on your door. This workshop will provide a balance between technical and business information. It is aimed at IT resellers those who are either considering offering “Cloud” computing or those who have just commenced the process. The workshop includes all meals (morning tea, lunch and afternoon tea), parking, Internet access, course notes and more. All attendees will also have access to a recording of the day for later use. The workshop will be given by Microsoft Office 365 MVP Robert Crane who is the Principal of the CIAOPS. At the end of this workshop you should have the confidence to know the Office 365 product indepth but also a range of business strategies that can be implemented immediately to not only benefit a “Cloud” practice but any business. This book I think is very handy as a reference book for people who want to ‘know’ all the functions of SharePoint. Typically, these are the people that feel they need to understand the length and breadth of a product before they are willing to experiment for themselves. With that in mind, it is not recommended that you read this book from cover to cover. Instead it will serve you better to use it as a reference when you start diving into the different areas of SharePoint. It will take you through all the options and explain to you exactly what they all do. The people that will get the most out of this book are those who are just getting into SharePoint and want to have something they can refer to when they see all the options that can get presented at times in the product. It would prove to be a very handy book to keep on the shelf as a business gets up to speed with SharePoint as it allows them to easily research just the part they are working with at that moment and continue to do that over time as their confidence with the product grows. In summary, more a reference book than a tutorial. It provides excellent coverage of just about all the options in SharePoint and what they all do. Is easy to read and would be of value to anyone who is getting into SharePoint and wants to know exactly what each option means. If you are just getting started with SharePoint and want to understand all the bits under the hood this book is an excellent starting point. 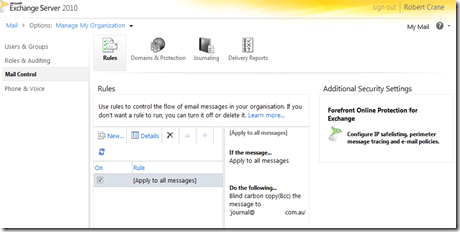 Here are two ways to have Office 365 emails archived on a system external to Office 365. One is Journaling the second is using a BCC rule. I’ll quickly cover both here. Select the Manage hyperlink from under the Exchange Online section in the middle of the page. 3. Click New to create a new journaling rule. 4. Pull down the first option list and select [Apply to messages]. Pull down the second option list and select All messages. Set an email address where the journaled messages will be sent. This email address should not be an Office 365 email mailbox. Finally, give the rule a name and click the Save button. 5. Click Yes to apply rule to all future messages. 6. Note the warning about NDRs. Click Close to complete. 7. 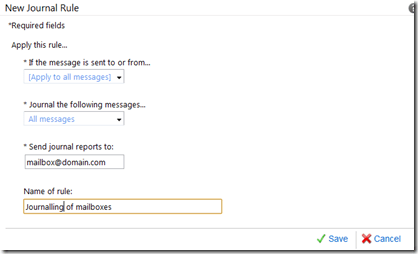 Now any messages sent or received will be forwarded to the email box you specified during the configuration. 1. Login into https://portal.microsoftonline.com as an Office 365 Administrator. 2. You will need to create a dedicated journaling mailbox. 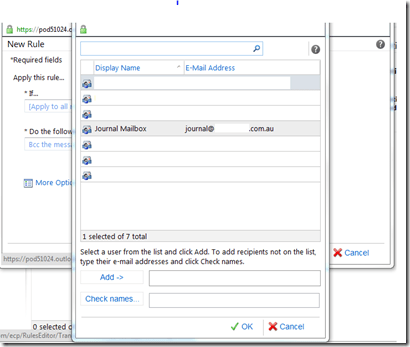 Do this in the normal way you create a mailbox in Office 365. You may need to assign an Exchange license to this mailbox. I would also assume that you could also create and use a shared mailbox for this purpose via PowerShell but have not tested that. 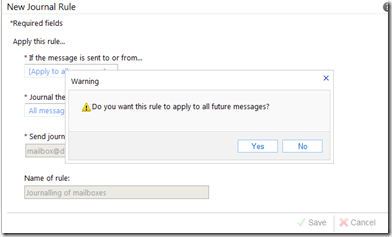 The advantage of using a shared mailbox is that it would not consume an Office 365 license. 3. 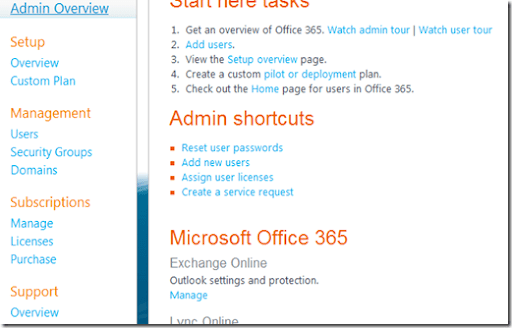 From the Home screen of the Office 365 administration login select the Manage hyperlink from under the Exchange Online section in the middle of the page. 4. 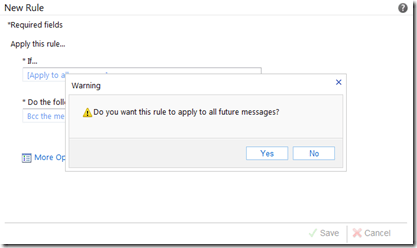 Select Mail Control then Rules from the Exchange settings. 5. Select New to create a new rule. 6. In the first pull down list select [Apply to all messages]. 7. In the second pull down list select Bcc this message to. A list of current mailboxes will appear. Select the journaling mailbox you created during the first step. 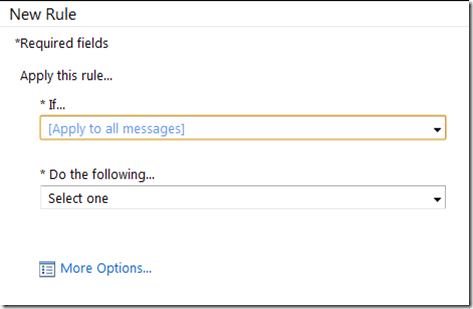 Ensure that the mailbox appears in the lower part of the screen next to Add –>. Then click OK to save. 8. You will be returned to the New Rule window. Click OK to save. Then click Yes to apply this rule to all future messages. 9. You will then be returned to the Rules window where you should see the new rule that was just created and a summary of its actions on the right. 10. Now all messages to any email address will be sent to the journaling mailbox you have created. The next step is to configure a remote archiving product to copy and then delete these emails from the journaling mailbox. 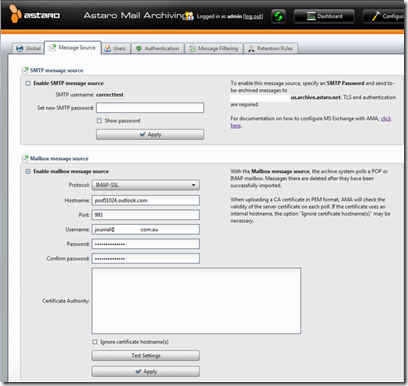 There are many third party tools that can be configured to do this, in this example we will use Astaro email archiving. Information about this can be found at: http://www.astaro.com/products/astaro-mail-archiving. After you have configured an account (a 30 day trial is available with Astaro) log onto the administration console and configure message retrieval. Once you have entered all the information select the option to Test Settings. Once that is correct click Apply. You will notice here that configuring the Astaro Mailbox message source that messages there will be deleted after they have been successfully imported. That will ensure the Office 365 journaling mailbox will not grow in size. That maybe why a shared mailbox could work, even given its limits. 11. 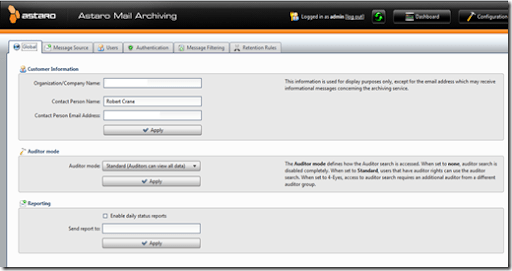 In the Astaro configuration you may also need to alter the Auditor mode to allow the viewing of all emails if required. You can configure additional users to access this archive but in this case all that is required is a single admin account that can view all the archived emails. 12. You should now be able to search the archive as email flows. 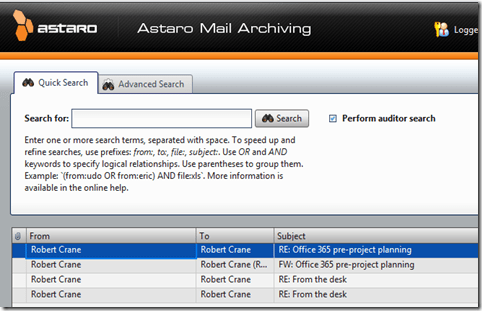 With the Astaro product the option to Perform auditor search may need to be checked as shown below to see all the emails. This option was only available if the auditor settings were enabled as shown in the previous step. Hopefully that has helped you understand two different configurations for externally archiving emails from Office 365. In this episode I speak with SBS MVP Kevin Royalty about what’s happening the in SBS space. We discuss topics like Home Server, SBS Standard and Essentials, Multipoint server and Backup Essentials. where you can also subscribe via iTunes and a number of different mechanisms. You’ll also find all the previous podcast episodes there as well. As always don’t be afraid to let me know what you think and what you’d like to hear on an upcoming episode. I’m always looking for guest to appear on the podcast so if you are interested in discussing a topic please get in contact with me (director@ciaops.com). The world is full of fiddlers. You know people who do something they are not supposed to and then not know how to fix it. I see this a lot with Companyweb on SBS 2011 for the simple reason that most network users are given too many rights. One of the issues that is apparently occurring more and more is that people are mucking up teh default homepage on Companyweb 2011. Getting it back can be a pain but Microsoft have released with KB article that should help. Basically you need to run a provide powershell script and you should be back to normal. I haven’t as yet tested this myself but will soon hopefully.